How do you go about designing a neutral bedroom without emphasizing one gender inspired style over the other? 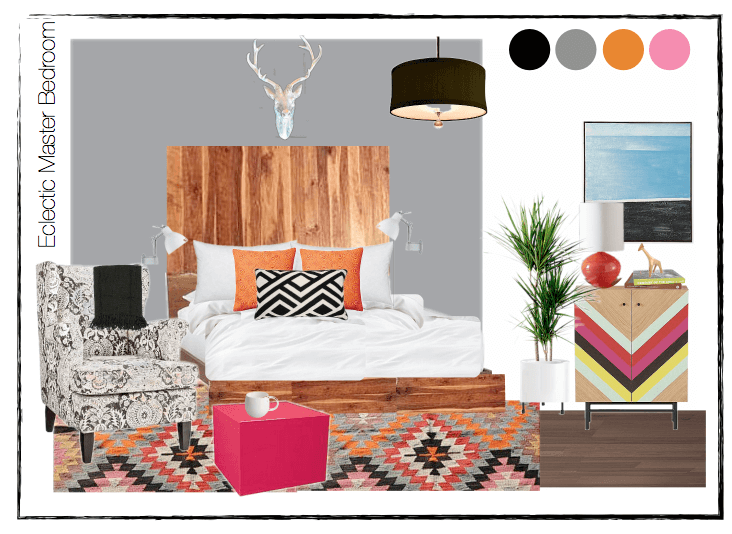 Recent clients approached Decorilla, looking for a natural, fun, modern design for their master bedroom. It was to be eclectic, but also neutral. One of the biggest challenges when designing a neutral bedroom is effectively incorporating both masculine and feminine styles. Now, calling a particular décor style feminine or masculine does not mean that the particular room is designed for only women or men. It just means that the room has qualities that are more associated with one gender more than the other. Decorilla designer, Christine M., set out to create a unique, exciting, inexpensive room that fully represented her clients. She used the following tips to help magnify the master bedroom. NEUTRAL COMFORT. A shared master bedroom for a married couple should be comfortable and welcoming for both people. A balance of masculine and feminine elements is usually ideal , creating a neutral space where both people can relax. HAVE A CONSISTENT COLOR PALETTE. Any style can work together with the presence of one consistent color palette. Color drives the mood of a design in a powerful way. Pink and purple tones tend to give off more of a feminine feel while, black or dark blue tend to give off a masculine one. Christine used four colors: grey, black, orange and pink. She used a nice light grey for the walls to make the room feel soothing and cool and used the remaining four colors to create a neutral rustic/modern balance in the room. KEEP IT CLEAN AND SIMPLE. Always have a couple simple foundational pieces that help bring the design together. 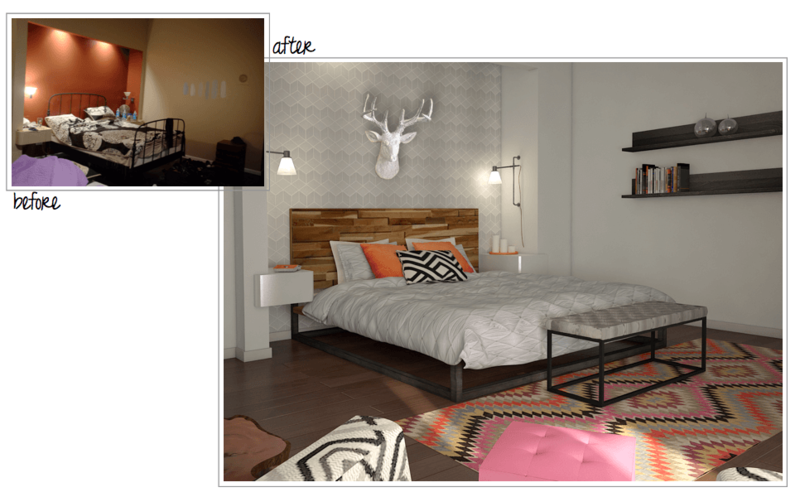 For Christine, those foundational pieces were the white faux deer head and the wooden headboard. Those two items did a great job tying the room’s style together and limiting the possibility of “too much going on”. Being mindful of keeping décor simple and uncluttered, helps in enhancing the relaxed feel desired in a bedroom. NIGHTSTANDS: Make sure that both people have a nightstand on their side of the bed with a lamp and an alarm clock. Keep in mind that all a bedside table really needs is a clock, a lamp, and maybe a small dish or a small candle. This will give each person a sense of personal space. A bedroom is somewhere to retreat to after a busy stressful day. But, without the proper design and décor, it tends to lack in comfort and serenity. Decorilla designers are always ready to help make your bedroom or any room into your relaxing dream space!